Studying compliance to uncover whether compliance is occurring, and what motivates it, is central to the broader study of governance. Contextualizing Compliance in the Public Sector: Individual Motivations, Social Processes and Institutional Design develops an interdisciplinary approach for answering a classic and essential question in any rule-governed context: What factors influence the decision of an individual or organization to comply (or not) with governing rules? Analyzing compliance from an interdisciplinary and multi-level perspective, this book examines the question of what motivates compliance in the context of salient policy issues, such as energy policy, water governance, police profiling, and drug policy, among others. The book brings together an interdisciplinary group of experts who explore the psychological, social, and institutional factors that shape compliance with formal rules embodied in laws and regulations and/or informal rules embodied in social norms. In doing so, they offer a platform for assessing individual compliance, compliance by or in the context of groups, and compliance on a systemic or societal level. 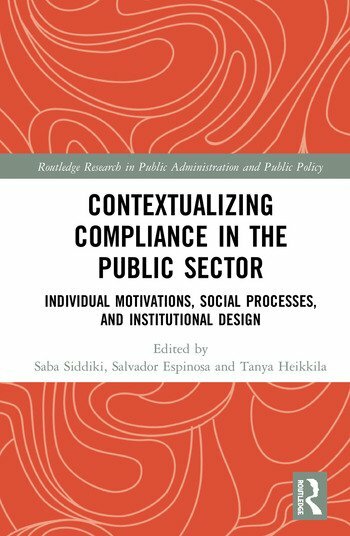 Contextualizing Compliance in the Public Sector: Individual Motivations, Social Processes and Institutional Designis an excellent resource for researchers and scholars of public administration and public policy conducting research on compliance, rules, behavior, and policy outcomes. Tanya Heikkila is Professor and Associate Dean for Faculty Affairs at the University of Colorado Denver. Her research expertise is in comparative institutional analysis and the management of collaboration and conflict around common pool resources. She has studied institutions for coordinating groundwater and surface water in the western United States, interstate water conflicts and cooperation, the organization of collaborative ecosystem restoration programs, as well as the political landscape of hydraulic fracturing in the United States. Saba Siddiki is Assistant Professor in the Maxwell School of Citizenship and Public Affairs at Syracuse University. Her research expertise is in policy design, collaborative policymaking, and sustainability related technology and behavior adoption. She has studied the design and associated outcomes of public policies used in food system and environmental governance. Within these domains, she has also studied the role of multi-stakeholder collaboration in policy design and implementation. Salvador Espinosa is Associate Professor of Public Affairs at San Diego State University. He specializes in public financial administration, public policy analysis, and institutional analysis. Dr. Espinosa’s current research agenda applies theories and methods from the cognitive and behavioral sciences to improve the effectiveness of regulations and public policy outcomes.